On April 20th, 2010, Deepwater Horizon, a semi-submersible Offshore Oil Rig that was set 41 miles off the coast of Louisiana, was set ablaze after fierce explosion. This event caused the massive oil rig to burn and sink and was trigger a terrible oil spill in the Gulf of Mexico, leading to the largest environmental disaster in U.S. history. Many know of the event (and of its aftermath fallout) as it was displayed promptly on various new media journalist outlets (newspapers, online articles, and many news affiliated broadcast networks). However, while many people may know the facts about the explosion on the oil rig, few know of the story that took place during such an event (i.e. an eye-witness account). To shed some light on what happened, Summit Entertainment and director Peter Berg releases a theatrical representation of the oil rig explosion that occurred on April 2010 in the movie Deepwater Horizon. Does the film tell the right or what happened or is just another Hollywood feature “larger-than-life” heroism? Mike Williams (Mark Wahlberg), a family man to his wife Felicia (Kate Hudson) and his daughter Sydney (Stella Allen), is preparing to spend the next several weeks stationed on The Deepwater Horizon, an offshore drilling oil rig that’s located 41 miles off the coast of Louisiana. Joining his boss Jimmy Harrell (Kurt Russell) on the floating vessel, Mark is baffled to see that many of the equipment on the rig is in need of repair, which is caused by BP oil and gas executives, including Donald Vidrine (John Malkovich), aim to cut corner to make up for the many lost days spent carefully selecting a sit suitable for drilling. While Jimmy is livid, challenging the BP executives on such reckless decisions, the go-ahead to drill is given, which immediately results in an insurmountable flow of mud and gas surging up the drill pipe, shredding Deepwater Horizon before being engulfed in flames. Surviving the initial shock, Mike searches for a way to safety, stopping to help his fellow co-workers, joined by Jimmy, Caleb (Dylan O’Brien) and Andrea (Gina Rodriguez) as the team navigates panic, bodily injuries, and a way off Deepwater Horizon. I do remember hearing all about the Deepwater Horizon explosion when it initially happened. However, while I was saddened to hear what happened and all of the aftermath effects that took place with the oil spillage in the Gulf of Mexico, I really didn’t pay attention to what all the meticulous details and survivor accounts of what actually took place on the oil rig. Which brings me back to the present in wanting to see the movie Deepwater Horizon. As always, I saw the trailers for the movie when I went to theater and kept on forgetting to post them on my blog for you guys to see (my bad). So with my combination of wanting to see the movie and to learn about what happened on April 20th, 2010, I decided to check out the movie. After seeing it, I felt that, with a few minor problems, Deepwater Horizon was harrowing and visceral cinematic tale that recreates the horrific incident that took place. Directing this move that’s based off of a true-life disaster story is director Peter Berg, known for his popcorn flicks like The Kingdom and Battleship, but (in recent years) has moved towards more “true life” account adaptations with 2014’s Lone Survivor, this movie, and his upcoming film Patriots Day (due out January 2017). While the events of the film happened, Berg’s feature, penned by Matthew Sand and Matthew Michael Carnahan, is based on actual accounts of those who lived through the events as well as the New York Times article titled “Deepwater’s Final Hours”, which was written by David Barstow. Tragedy aside, the incident of Deepwater Horizon is ripe for a big screen adaption, placed in the disaster thriller / action subgenre variety that has more emotion and accessibility here than just to simply to entertain viewers. In a nutshell, Berg seems to channel the effectiveness that he did with Lone Survivor, trading out battle-hardened Navy Seals for the workers of the “blue collar” field. The film’s beginning introduces the world and several characters, following them through the personal lives before bringing them to Deepwater Horizon oil rig and their soon-to-be head-on collision with disaster. What also makes the film good is that Berg doesn’t make bigger than what it was. Meaning that Berg doesn’t go all “Hollywood” with the film. Yes, the set pieces are big and a barrage of explosions to fill up the screen from time to time, but it never feels that he doesn’t go overboard in his cinematic representation of the event. Where the movie truly shines is when catastrophe takes center-stage at the film’s halfway point (during the second act). This is where Berg’s directing skills prove to be the best as he sets up incredible (yet horrific) shots of destruction and mayhem on-board Deepwater. Again, the calamity doesn’t pull ahead and out of the director’s hands as he seems to have a steady grip presenting such horrors in that way feels true and not big time disasters features by Hollywood. Once pipes busts, heavy duty equipment is engulfed in flames, and people are being thrown around like rag dolls, the film’s adrenaline level is ultimately kicks in, an odd sense that’s both stunning and horrifying to watch. From them on, the feature goes into full “disaster / rescue mode”, showing the harrowing attempts of evacuation from the rig as more and more chaos ensues. I was literally on the edge of my seat and swear i felt my heart “racing” throughout the whole second-half of the movie and film hasn’t done that this year since Michael Bay’s 13 Hours: The Secret Soldiers of Benghazi. Even ending of the movie (post-rescue from the burning rig), Berg does a great job in showcasing the impact that the events has on those who were effective by it (whether by those who were on-board Deepwater or concerned love ones). Like Lone Survivor, it’s an unsettling and emotional ending that will resonate with a viewer long after you finish watching the film. Just like the terrible disaster on the oil rig, Deepwater Horizon does have a few problems that do arise up from its ocean depths. In an attempt to make the picture feel “authentic”, Berg (and his writers) infuse a lot of oil rig jargon and terminology into the movie. While it helps make the film’s world more believable (establishing the setting and situation), an average moviegoer might get a bit lost with so many terms and word usage (I certainly did) that seems like “nonsensical” engineering talk. Another problem in the movie are the events that take place before April 20th, 2010 and the reasoning behind BP’s cutting corners. Many characters in the movie call the well that Deepwater Horizon is drilling from the “well from hell”, but they’ve really say the reasons why there’s so much trouble with it. The same goes for BP, the big corporation behind Deepwater Horizon’s drilling operation, and the reasons why they decided to reduce the crew’s operations procedures as well as shortchanging the rig’s internal upkeep. They give a vague reason (Deepwater is behind on its drilling schedule), but it seems vague, making the personnel of BP out to be greedy henchmen of a big “faceless” corporation. In short, the machinations behind their reasons is never fully brought to life, with Berg making them out to be the “bad guys” of the feature. In terms of acting, the cast of Deepwater Horizon is pretty good, collecting several big name / recognizable actors to portray its various characters. The problem, however, is that the movie isn’t a character piece (despite its emotional tale of survival through a hellish ordeal), with the feature more focuses on it the oil rig’s destruction. Because of this, many (if not all) of the film’s characters are stock-like characters that’s based on their initial onset personas that can be likeable or relatable. Basically, this means no well-rounded dynamics. Fortunately, majority of the cast does a great job in these thinly written roles. As the film’s lead actor, Mark Wahlberg, who’s been several leading roles before, including Berg’s Lone Survivor and Patriots Day, brings his charisma to the “everyman” role of Mike Williams What makes his character relatable is that, while he played Marcus Lutrell in Lone Survivor (a trained Navy Seal), the role of Mike Williams is just your average “good guy”, who gets caught in a maelstrom of fire turmoil around Deepwater. Thus, Wahlberg’s performance is solid as he doesn’t get go overboard in his acting or in his action heroics. While Wahlberg’s Mike Williams might be the protagonist of the film, John Malkovich’s Donald Vidrine is somewhat the antagonist or rather the catalyst to the real antagonist (the oil). Effectively, Malkovich’s Vidrine is a slimly and conniving character that feels like a manifestation of “big corporate” greed that plays at hand in Deepwater’s ultimate downfall. Again, it works for what Berg’s angle of the character, however Malkovich uses a weird Cajun-style accent with Vidrine. Behind them is seasoned actor Kurt Russell, who plays Jimmy Harrell, a senior operative manager of the oil rig. Like the rest, Russell’s character isn’t anything relatively new, but is elevated by his acting talents and overall likeability. 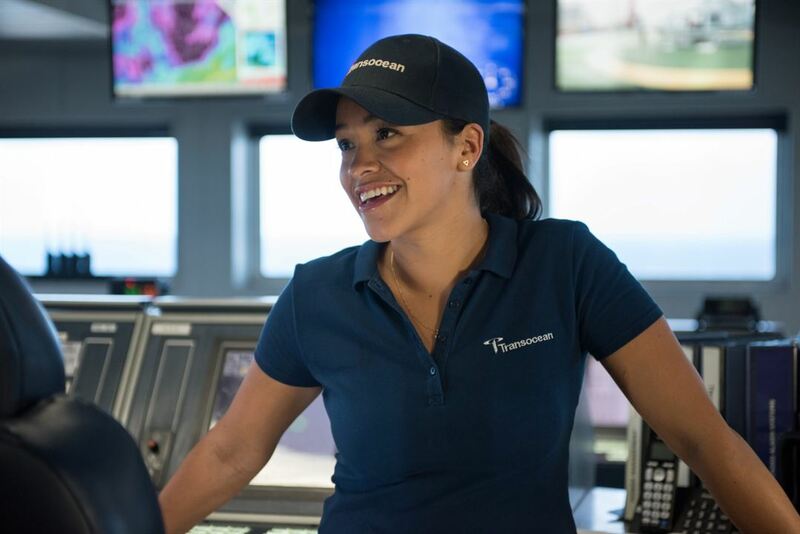 Then there’s Gina Rodriguez’s character Andrea Fleytas, who doesn’t have to do for most of the movie, until disaster strikes, allowing the Jane the Virgin star for some dramatic acting moments. Actress Kate Hudson play’s Felicia Williams (Mike’s wife) and does good “standard” job in the role of the worried / concerned wife (a cross between Sienna Miller in American Sniper and Holliday Grainger in The Finest Hours). The rest of the cast, including Dylan O’Brien as Caleb Holloway, Stella Allen as Sydney Williams, and Ethan Suplee as Jason Anderson, are more supporting players “cogs in the machine” in Berg’s grand scheme of the movie. Plus, there’s a cameo like character appearances from country singer Trace Adkins (titled “massive man”) and from director Peter Berg himself (as Mr. Skip). Lastly, like the ending of Lone Survivor, Berg pays a touching tribute to those who perish in the Deepwater Horizon disaster incident, accompanied by the song “Take Me Down” by Gary Clark. Jr. Experience the horrifying events of a burning oil rig in the new disaster action-drama movie Deepwater Horizon. Director Peter Berg latest film is, while not as grisly as Lone Survivor, is a poignant movie, showcasing the dangerous life (in a face sort of worst-case scenario) that many in the public eye don’t know about. While it lacks characterization and some plot holes to fill in the gaps, the movie works in its effectiveness in laying out the destruction of the oil rig and awe-inspiring courage of those who survived this terrible ordeal. Personally, I liked it. It was a good movie (a bit nerve-racking), but ultimately a powerful picture that explores the horrifying events of what happened on-board Deepwater Horizon on April 20th, 2016 (via a cinematic lens). Thus, I would highly recommend the movie. It’s definitely worth a glance in theaters. Much like what I said about the movie Sully, Deepwater Horizon (the film) isn’t a thematically picture perfect feature film, but it is still palpable and respectful to its real-life counterpart, with the possibility of prompting viewers to revisit the real-life tragedy of the Deepwater Horizon explosion incident. Sounds better than I think it would be. Haha….I actually liked it. Not much of character bio-pic, but it was solid movie in what it wants to tell. Aha I’ll have a slice of that pie. Hard-hitting and compelling, as well as it needed to be. Nice review. I agree with you. Thanks for reading! I saw it last night, the pace was a little strange as the build up to it happening was so tense. Then it was like finished straight away, enjoyable though! Thank you for reading! Yeah, the movie’s first act was slow with too many oil rig talk, but the second half of the movie was pretty tense.